Note from GuitarAttack: Doesn't this make you want to build a bass kit? I finally finished another kit. My sweetheart of a girlfriend bought me another kit on eBay for $26. 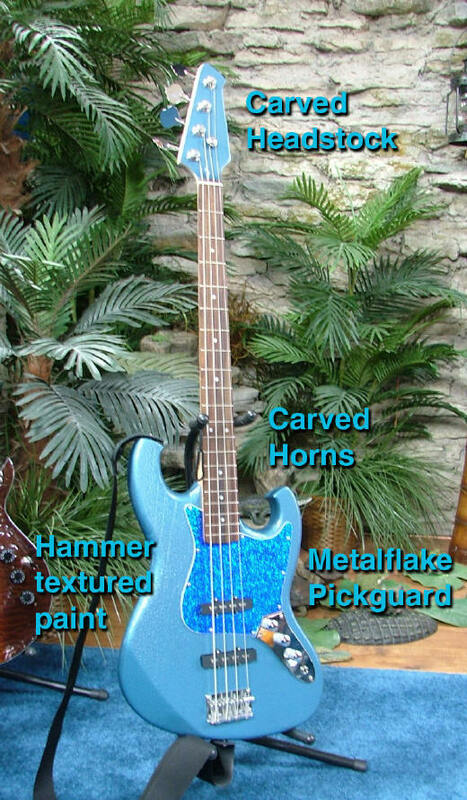 This one is a jazz bass. I did a bit of carving on the horns (sort of my trademark) & slightly on the headstock. The bad thing is that there were some soft spots in the wood grain that would not sand down evenly, so to try to hide those imperfections, I used a hammered textured paint. It helped some, but there are still some wood grain valleys that show through. It sounds really good & plays very decent after a slight shim job on the neck. Probably the worst feature on this one is that the headstock is top heavy & annoying to let go of with the fretting hand. Anyway, Thought I'd share it with the kit builders of the world. Note: Jeff is a great friend and helped us out on a recent problem we had at work. Thanks, Jeff -- ROCK ON! Thanks, Jeff -- Great Job!